Jonalyn is a mom of 5 who developed her love for endurance sports after suffering a pulmonary embolism in 2011. She dipped her toes first into running in the fall of 2012. Always suffering nagging running injuries led her son, a triathlete himself, to offer her the use of his bike and invite her to swim with him. When he bought her a bike for Christmas 2014, she decided she should sign up for a triathlon and give it a whirl. Her first triathlon was the Big Blue Adventure Lake Tahoe Sprint Triathlon in August 2015 where she sported the same bib number that her son had worn competing the same race in 2014. Placing 4th in her age group got her hooked. She competed 3 more triathlons in 2016, including the same Big Blue Adventure Lake Tahoe Sprint Triathlon where she improved her age group placing to 3rd. 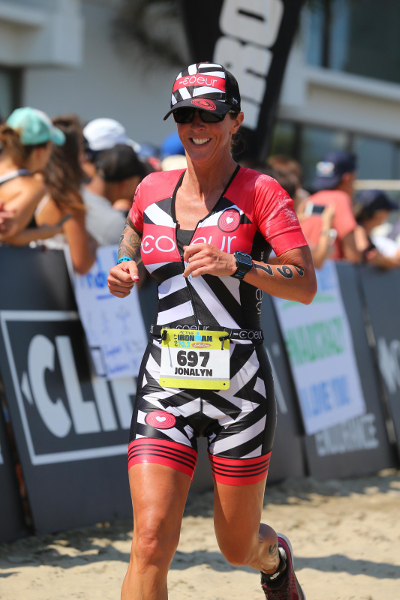 They say the third time’s the charm, and this proved to be true for Jonalyn when she won her age group at the Lake Tahoe Sprint Triathlon in 2017. She also completed her first Half Ironman at Santa Cruz in 2017. While 2018 will be dedicated to aquabike and open water swim racing as she heals from hip surgery, she has her eyes on completing a full IRONMAN in 2019.